Our Card Shape of the Month feature continued with April’s Zig Zag Fold Card, great if you want to add an original card style to your papercraft portfolio! Using your sewing machine, you can create these beautiful cards. We made 3 different layouts with varying degrees of difficulty for our Sewing on Cards tutorial, helpful for new and experienced sewing bees! Great for all ages, this Kidscraft DIY Washi Tape Pencil Pot tutorial is great for entertaining the kids at the weekend. Children will love making these stationery pots bright and colourful with their washi tape. You can enjoy a free template with our Roller Skate Card tutorial, great for making for disco divas or skating dare devils. We love the mixture of glitter card and the embellishments on the wheels! Your children will love making these DIY Dolls House and colouring the free printable furniture templates. It is also a great way of recycling your old shoe boxes! Our Design Team member Katie created another scrapbooking tutorial with an introduction to mixed media. The tutorial is useful tips and shows you how to experiment with your scrapbook page by using inks and stencil masks. 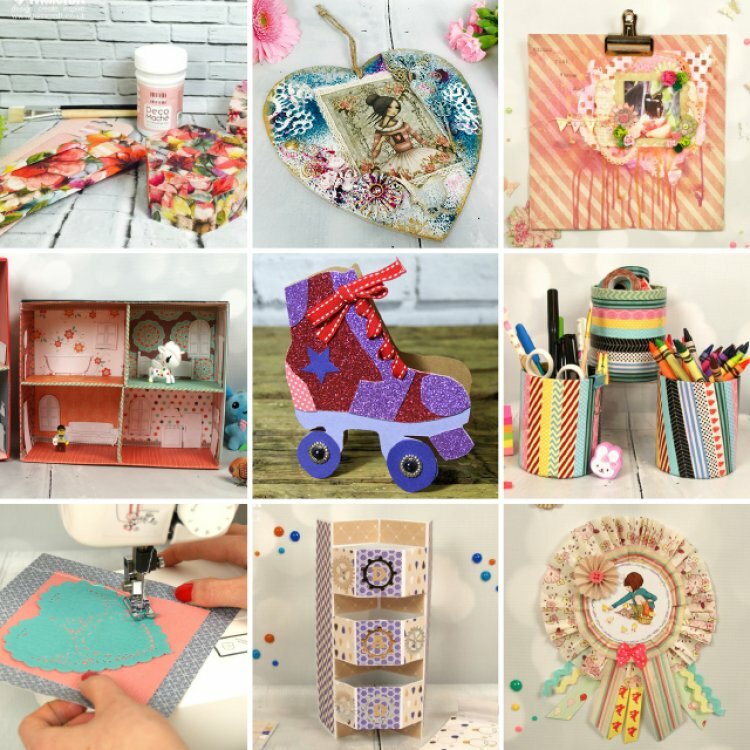 We used our new Santoro Mirabelle decoupage paper pad in our colourful Mixed Media Craft tutorial. There are 3 different projects for you to enjoy and experiment with. Make personalised gifts and upcycle your treasured ornaments with our recent How to Deco Maché Tutorial for decoupage beginners which includes some handy hints and tips to get you started.